Billie Ray Martin Archives - Joe.My.God. 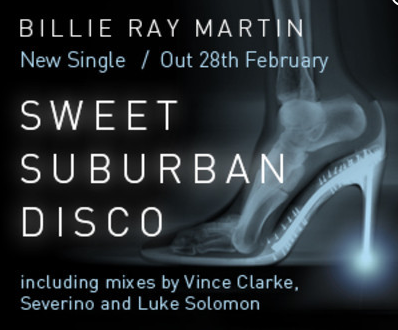 House music legend Billie Ray Martin, whom you may know from her 1995 smash Your Loving Arms and Electribe 101’s big 1988 hit, Talking With Myself, is back in a new collaboration Italian bear/queen Hard Ton. The track is free to download for the next week. Artists, titles, and a download link. [Photo credit] RELATED: Original and exclusive mix sets by new and nationally renowned DJs will return to JMG in early 2012! Former Electribe 101 frontwoman Billie Ray Martin continues to pump out goodness. This time it’s retro gay disco with a shout-out to Ring My Bell. And hit this link for a free download. House up your weekend with the latest from Electribe 101 legend Billie Ray Martin. This is from Sold Life, her coming collaboration with underground buzzmakers Hard Ton, which is due out on April 26th. Billie Ray Martin covers the Cabaret Voltaire classic.